Lovely Lake Louise, our most popular package, takes advantage of the fact the Rocky Mountaineer travels between Vancouver and Lake Louise. This Lake Louise focused package includes one night in Vancouver, two days on the Rocky Mountaineer between Vancouver and Lake Louise. Ending your train trip at Lake Louise has several advantages: you arrive in time for dinner at the Chateau, you get to visit the adorable Lake Louise train station, you have a guaranteed lake view room at the Chateau and your introduction to the Rockies occurs at its most magnificent location. 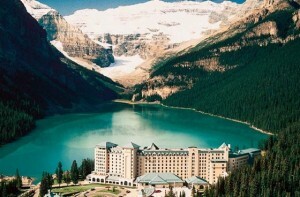 This package also includes one night Vancouver, in Kamloops, en route and in Banff National Park. Enjoy a free morning to explore the Chateau and its grounds before your tour to Banff National Park in the afternoon. You’ll spend one night in Banff then transfer from Banff to Calgary airport for your flight home. Lovely Lake Louise can be customized with additional nights in the Rockies, a rental car, tours of Banff National Park and/or the Columbia Icefields and Jasper National Park. Call 1-604-990-9299 or 800-913-9207, Email for more information and reservations. GoldLeaf Deluxe: All the amenities of GoldLeaf Service with upgraded hotel rooms along the way.